RELIABLE – Great knot strength helps you maintain a good hook set. LOW MEMORY – Now you can achieve longer, smoother casts! KastKing Copolymer fishing line has less stretch than monofilament line, but more than braided line or fluorocarbon line. GREAT VALUE – Featuring only the highest quality components for the best price on the market. KastKing Copolymer Line delivers what other brands can’t! LOW VISABILITY- makes it perfect replacement for a fluorocarbon leader line or instead of using an obvious wire leader! 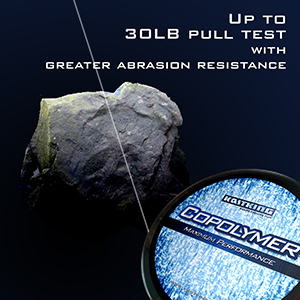 ABRASION RESISTANT - It’s always been a challenge to find the perfect line with just the right amount of abrasion resistance, castability and breaking strength without having to go to the extreme of using a small or large diameter fishing line. KastKing Copolymer Fishing Line is created to give you premium strength while still retaining low memory and visibility. KastKing Copolymer line is a combination of formulas that give it the best characteristics for varied fishing situations. Uniquely designed KastKing line has a low memory that allows you to achieve ultimate castability! In addition to clear line, KastKing copolymer line comes in multiple colors including green, copper, and camouflage color. There’s no longer any reason to overpay for high-quality fishing lines anymore. 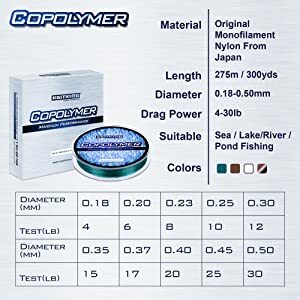 Whether you are fishing saltwater or freshwater, trout fishing, bass fishing, or ice fishing, you can count on KastKing Copolymer line to become your next favorite fishing line to use as a main line or to tie on as a leader to braided fishing line. It’s what belongs on your fishing tackle. and saltwater it is a good choice for bottom baits, trolling, and moving baits. 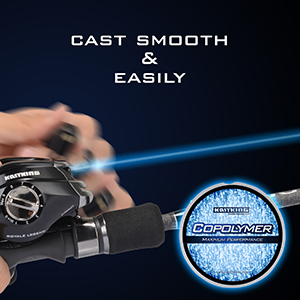 Get faster and smoother casting without wind knots. 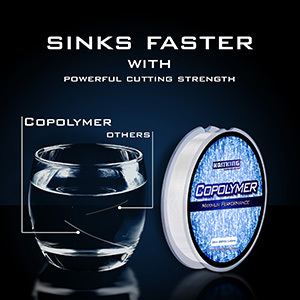 KastKing copolymer fishing line sinks faster with powerful tensile strength. Copolymer material gives the line superior abrasion resistance. First off let me say, I am retired and fish 2-3 days a week year-round weather permitting. I initially bought this line looking for something better. The line had good reviews so I ordered a spool of 8# test. I use this line on my Jig Pole Crappie fishing heavy cover. Other lines I have used were OK but could not stand up to rigors of constantly getting hung up and the abrasion caused when fishing such heavy cover. After my first trip I was sold, this line has very little stretch, superior abrasion resistance, and is one tough line. I have been using it for 3 years now and it is all will use. This line gives me the confidence of wrestling those 2+ lb. Crappie out of heavy cover without the fear of the line breaking. Casts smooth, tough line. Love it for fishing rocky bottoms with bait or lures.Tie Palomar knots to swivels and knotless snells to hooks- clinch knots will slip.EDIT:I see several reviews mentioning a propensity for tangles. 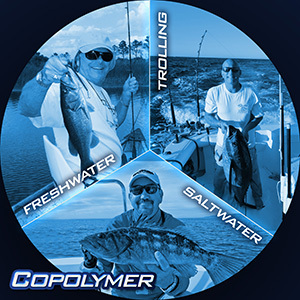 Copolymer is a low memory material and will tangle on spinning reels if over-spooled, regardless of the brand. It will also "dig in" if you lock your drag and pull free of a snag.Spool a little less line than you would with regular mono. If you need to pull a snag, wrap your line around your reel's stem several times, leaving slack on the spool side, then pull. The main company I purchase line from. Very trusted. Never let me down! My new string... Landed some lunkers and the string was tougher than the known name brand I only used.